Are 3D printed Cheeseheads next? In the old days, before sophisticated CGI animation, movie and television production crews would have to do all the fancy imagery they could muster by hand in one way or another. To create their illusions, they performed tedious, detailed work directly on the film, used a bit of smoke and mirrors or otherwise physically changed reality. Once computer graphics and animation developed, in sync with the powerful computers required to run them, everything changed, with the ability of creating illusion digitally. 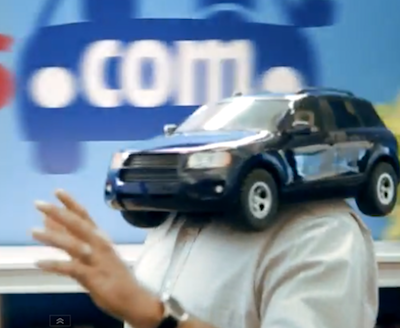 Recently, Edmunds.com wanted to create a new commercial which required its actors to have miniature cars above their necks, in place of their heads. In the old days, decades ago, craftsmen would have created the hollow car models by hand, which would then fit over the heads of actors for the shoot — something like the cartoon characters come to life at Disneyland. By contrast, since the advent of CGI, it would be more realistic to just film the actors with nothing worn over their heads and then digitally replace their heads with the car models after the shoot in the computer. Now with 3D printing, Edmunds was able to choose a new way to accomplish what they wanted. It goes back to the quaint methods of the past, placing the hollowed-out car models on the actors’ heads. But, rather than making them by hand, they were able to design them with 3D modeling software such as Solidworks and Rhino, and then print them on a stereolithography (SLA) 3D printer (at rapid prototyping and 3D printing company, Solid Concepts). Better results for less time and money–that’s 3D printing. An interesting tidbit is that they needed the cars they created to look familiar to viewers, but they could not be recognizable as any specific make or model. So, they had to create mashups of several cars, for example, a cross between a Camaro and a Mustang. (Would that be a Camtang or a Mustaro?) Sounds like a fun process. You can see the results of all this in the actual commercial below. With CGI-developed commercials looking so slick, I appreciated the retro feel to this. I think it will turn out to be quite an effective piece.